This men's figaro id bracelet is perfect for all ages. It makes a wonderful gift for boys and young adults at birthdays, communions and bar mitzvahs. It is easily adjustable to any size from 7 to 9 inches in length. The gorgeous figaro link is one of our most popular styles. 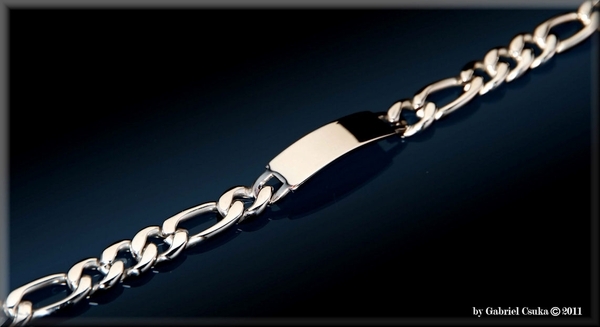 316L Stainless Steel Bracelet with Figaro Linked Chains & Engraving Plate. Get this bracelet engraved with your name, a special date or any other message you'd like. Stainless steel is very attractive and extremely durable. It keeps its luster much longer than other metals. Feel free to wear it on a daily basis. The lightweight design makes it a sporty style thats easy to wear. This stainless steel ID bracelet makes a great everyday accessory! Its perfect for any occasion, for casual and formal wear. This men's figaro bracelet will be a wonderful gift that they will always remember. Our custom engraved stainless steel I.D. bracelets are crafted with High Polish 316L Surgical Stainless Steel; the highest grade of stainless steel used in the jewelry market. It is fantastic at resisting fade, blemishes and rust. It is 100% resistant to corrosion. It will not fade, change color or leave stains on your body. It doesn�t require any maintenance to keep it looking new! Feel free to wear it outdoors, during sports activities (hiking, running, swimming, etc. ), or in the shower without having to worry about keeping its luster. The stainless steel we use for our high quality I.D. bracelets is the most worry-free and maintenance-free material for jewelry.